This is a non-commercial website, it is a sort of online guidebook on the city of Rome, Caput mundi! This is the only online guide of its kind giving historical and practical information available, as well as information on accommodation and the sights. Rome, the “eternal city”, is so called because it is a place of great beauty, contrast and life. Rome is an ecletic city: the religious world centre of Catholic Church, the fabulous ruins of the centre of the Roman Empire, and modern, bustling Rome. All three seem incongruous, yet they live inside and beside each other with great ease. You will soon realise Rome was build to rule and dominate the world. Everything is on a massive scale, solid and “eternal”. INFORMATION: discover the greatness of Rome: Monuments, Museums, Buildings, Churches and Basilicas, Catacombs and Rome’s Castels. Don't loose a walk in the gardens and villas or in search of the wonderful fountains of the city. Take not of Holiday and Feast in Rome! If you want to feel the roman atmosphere take a walk through the local typical markets! And don’t forget to taste the Roman cuisine or … why don’t take a course of Culinary Art in Rome? 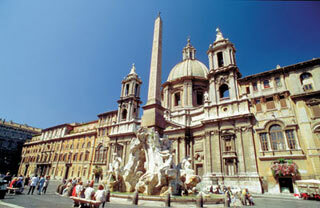 Have a look at our webpages about Itineraries in Rome or in Lazio or, if you prefer look at our Photo Gallery! Finally if you want to know the italian way of life then attend an italian language course! ACCOMMODATION ONLINE BOOKING: where to sleep with different offers for hotels in Rome: search on our complete and secure on-line hotel and accommodation reservation service to find the right hotel in Rome for your needs. Skip the Line: Vatican Museums Walking Tour including Sistine Chapel, Raphael's Rooms and St Peter's. Or you can easily make a ticket reservation with us for your visit to Rome Museums or Vatican Museums skiping the line. Tour and City Sightseeing in Rome: we are pleased to annouce that there are a lot of new services for the visitors of our website. Now you can organise your visit of artistic and historical Rome in a very simple and fast way. We propose you a wide range of services: from the simple purchase of the tickets for the double-decker tourist bus (hop on hop off) or the Sightseeing Cruise on the Tiber River, to the thematic guided tours inside or outside the wall of the italian capital (ancient Rome, Christian Rome and walking tours). Find also our suggestion for guided tours and excursions outside Rome. What are you waiting for? Go ahead and organise the beautiful holidays in the imperial city!!! Itineraries in Rome: Discover the Vicus Caprarius, called also “The City of Water”, a fascinating archaeological area in the heart of Rome. This spectacular area is a recent excavation of a imperial roman quarter. In the Vicus Caprarius the same water of Trevi Fountain gushes out. Transportation in Rome: all you need for moving in Rome is here. 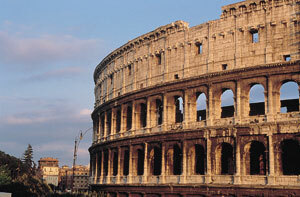 We've just added new pages about renting a car in Rome and about the aiports of Rome. Here you will find very useful information regarding the two aiports in Rome (Fiumicino and Ciampino) and the airport transfer services. New on aboutroma.com a special section on Roma Passcard a cultural touristic card which offers a lot of advantages for tourists from reduced tickets to discounts for the artistic events musicals and other cultural initiatives. ADDRESSES: in this part you will find useful address for any convenience or need: emergency numbers, location of Embassy and Consulates, Medical Service, but also where to rent a bike and our list of wash & dry or Internet Points in Rome! Welcome to the “eternal city”!